Collette & Harry actually married with us in 2017, so we are a bit behind in sharing this with you, but better late than never hey? 7th July 2017 was a scorcher. Luckily, our lovely couple had flown in from Australia so they were used to the heat. Collette and Harry are originally from England but had relocated to Australia 6 years earlier. When they started to plan their wedding celebration, they knew that they wanted a Tipi wedding in the English countryside and we were only too happy to help. Harry’s parents originally viewed the venue, Phoenice Fields for them and we shared images over email. Luckily for us, Collette and Harry took a leap of faith and booked their English wedding without having actually seen their venue. Initially, it was a little over their budget, but we made some supplier suggestions and were able to bring the big ticket items in on budget. During a family visit, they finally saw their wedding reception venue on a cold January morning but instantly loved it, so huge relief all round. The logistics of planning from abroad meant it was really helpful for Collette & Harry to have us manage some of their key suppliers. The time difference didn’t get in the way of a smooth planning process and in building a lovely rapport with this great couple and so as the day finally arrived, we were nearly as excited as they were. It was an early start the day before the wedding as we met Tentario at 6.30am at the field to start putting up their giant hat and kungsornen arrangement. Rustic tables and chairs were set out ready to be dressed for the guests with personalised candles in scents of Jasmine, Honeysuckle and Coconut. The dance floor was laid ready to party, and strings of festoon lighting were hung from the tipi peaks down to the ground to give a gorgeous evening glow after the sun had set. With family and friends on hand to help put the finishing touches to the venue in the afternoon, the couple could get away for a family meal on the eve of their wedding and prepare for the day ahead. The morning of the wedding dawned bright and sunny and I was busy on site putting the finishing touches to the tables, the tents and making sure that everything was just right. The tipi was soon a hive of activity being dressed with stunning floral arrangements from Jennifer Pinder Flowers, including a gorgeous floral hoop hung from the tipi crossbars and crates of flowers bursting with scent and colour. Darren and his team from Catch A Fire were busy preparing a delicious feast of charcuterie sharing boards, vegetarian and seafood paella, with a selection of sharing desserts to finish. The team from Coxtails arrived on site to set up the bar from their funky converted van. The menu included two fantastic personalised cocktails based on the bride and groom, ‘Mister’ and ‘Missus’. The Missus was a delicious peach bellini, and the Mister was elderflower, gin and soda water. At 1pm, Collette and Harry became husband and wife in front of family and close friends at the Catholic Church of St Edward the Confessor in Guildford. After a heartfelt service, the wedding party and all their guests made their way to Phoenice Fields. 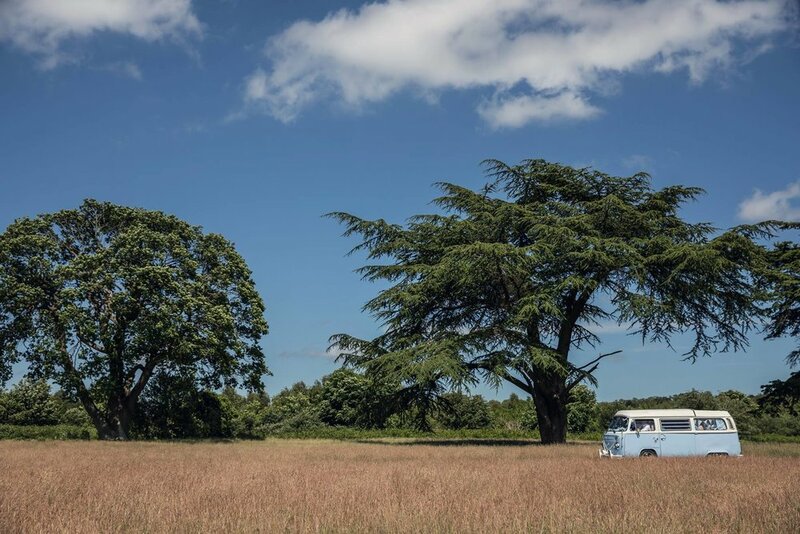 The guests started to arrive at the field around 2.30pm and were delighted by the sight of the tipis standing proudly in their traditional countryside surrounding, beautifully decorated and bathed in sunshine. After stopping for some photos en route, Harry and Collette arrived together looking every inch the perfect newlywed couple. Harry looked extremely smart in his bespoke 3 piece suit in a mid-grey Prince of Wales check fabric and a classic white shirt from Oscar Hunt Tailors on George Street in Sydney, and Collette was effortlessly stunning in her bridal gown from Irish designer Catherine Deane and wore the Ashton gown. The dress was purchased from an Australian stockist called Babushka Ballerina at their studio in Paddington. 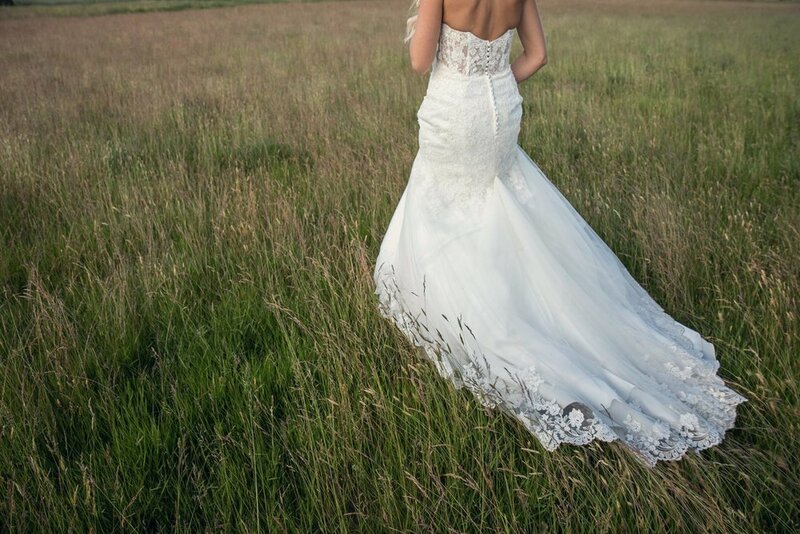 Collette tried on a few dresses at various different places but loved the simple silhouette of this gown paired with the intricately detailed beading and embroidery, particularly the floral embroidery that was very fitting for an outdoor wedding in the English countryside. The Coxtails bar was open and in full flow. 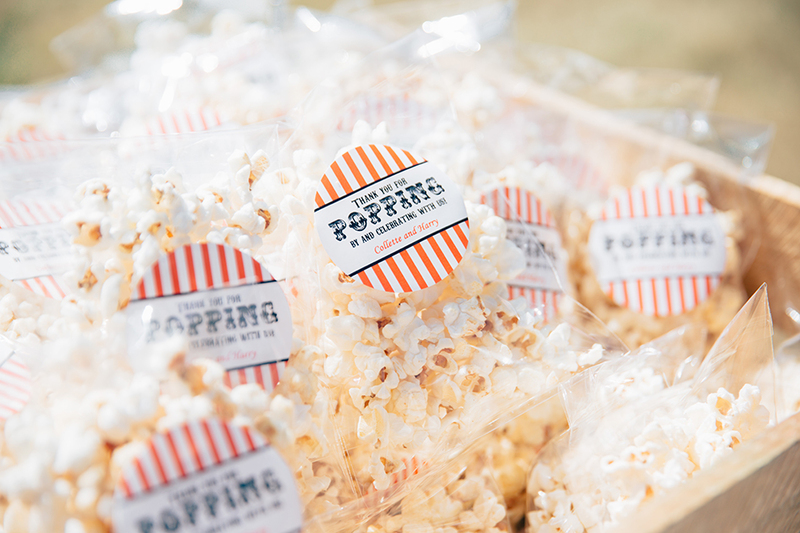 Personalised bags of popcorn and treats were available to nibble on until the wedding breakfast was ready. Kate Forster was busy capturing the happy couple, their families and guests as the mingling, congratulating and celebrating got under way. Mid-afternoon came around and at 3.30pm, Best Man and Master of Ceremonies Liam invited the guests to be seated, ready for the wedding breakfast to begin. With the weather being so glorious, all the sides of the tipi were raised and so the wonderful Surrey countryside could be viewed from every guest’s seat. Such a beautiful backdrop. Collette and Harry took their seats to a round of loving cheers and applause as the Catch A Fire team sprung into action to serve up the delicious menu. After the meal, it was time for speeches. Harry’s two Best Men kicked off proceedings with lots of laughter and fond memories across many years of friendship. Collette’s extremely proud Father gave a very moving speech which reduced most of the wedding party to a tear or two, and then both Harry and Collette finished off the speeches each with their own words for each other and for their families. Meanwhile, the evening entertainment had arrived, and DJ Owen set up inside the dedicated party kungsornen tipi ready to kick off the dancing come the evening. The cake was cut and Harry and Collette stepped onto the dance floor for their first dance as husband and wife. As the couple danced to Country Girl by Primal Scream, the sun was starting to set, the festoon lights were glowing, the firepits were lit, and the atmosphere was just beautiful. To keep the guests going into the evening, the team from Catch a Fire served up a selection of hand made wood fired pizzas. At 11pm, the amplified music switched to chill out tunes as the party started to wind down before guests made their way home, across the field to their waiting taxis.Collette and Harry’s wedding was a truly unique and personal day full of love from friends and family who had travelled across the globe to celebrate with this special couple. We wish Collette and Harry every happiness for a long future together and are so pleased to be able to share in your story. FF - Do you have any tips for other couples? C&H - We wouldn’t change anything!! It really was the perfect day! I guess my only tip would be to consider that in case it does rain, make sure that the tipi would be big enough to hold everybody if you had to have the sides down. We were worried that if it rained it would be very small, but luckily we had perfect weather!!! FF - What were the highlights for you? C&H - To be really honest the highlight was just getting married after 11 years of being together!! The day was actually more than we had hoped it would be and a huge part of that was you ensuring that everything ran perfectly!!! Set up started with 4 giant hats from Country Tipis. 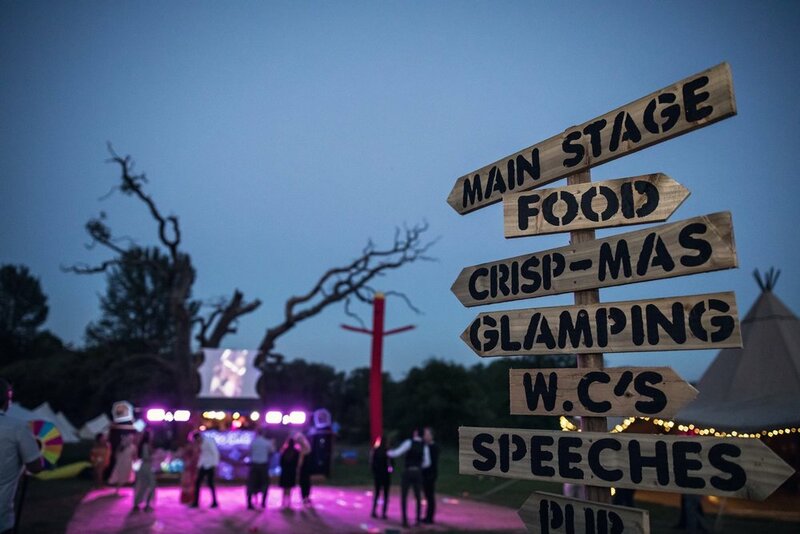 The tipis would comfortably hold Kat & David’s 180 guests, with room for a dance floor and indoor bar and chill out area. Not that Kat and David really wanted to use this space. It was an impressive backup plan in case the weather didn’t allow their ideal scenario, which was to host as much of their wedding outside as possible. It was a huge relief for us all when the weather played ball. 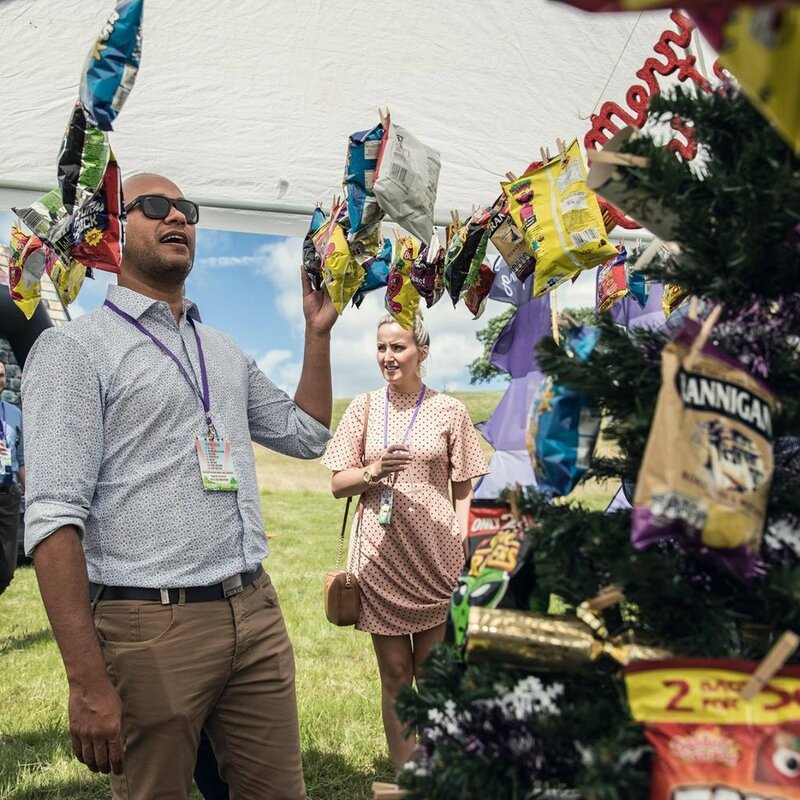 On the morning of the wedding, everyone was busy with final preparations; emptying all the ice and alcohol into the little booze paddling pool; pinning bags of retro crisps to a little Christmas tree for ‘Crispmas’. The inflatable pub, yes you read that right, was quickly fully inflated in front of the wooden benches in the ‘beer garden’. Paddy and Manny from Disco Wed were in construction mode, setting up their DJ shed in front of the awesome outdoor dance floor. At pretty much the last minute, David and the lads disappeared to their hotel for a quick change and came back looking very dapper in their grey trousers and waistcoats. Up on the hill, the seating was being set out for the ceremony, looking out over the beautiful blue skies and green fields. Cocktails and beers were prepped for guests’ arrival and guitarist James Maclean was ready to play. The pretty archway and heart sticks were set up with the help of the couple’s adorable little boy Davey. A final check that everything was to his approval and David was ready. A bit of traffic on the M25 delayed proceedings a little, but I don’t imagine there were any complaints as guests mingled in the sunshine with their drinks. All the guests were finally in place and Kat and her girls were on their way. After the ceremony, Kat and David led the way into Hidden Valley (played in by three tunes chosen by David for Kat (“She’s so lovely by Scouting for Girls, She is Love by Oasis and The Kooks, Naïve!!) Guests, waved in by the two Air Dancers, were met at the bottom of the path by a couple of the ushers to hand out their ‘Til Death do us Part Festival’ lanyards. Some made a quick detour to the bell tent village – 23 tents from South Coast Glamping, to drop off their things, others headed straight to the paddling pool to grab a drink, or a cocktail or slushy from the bar. Soon the smell of fish and chips was wafting around and a queue quickly formed at KK Catering’s van. The whole afternoon was totally chilled with people eating, drinking and enjoying the music and the sunshine. At 4.30 guests were asked to make their way into the tipis for the speeches. After which Kat and David popped off to have some stunning photos with Sassy from Asassynation. Meanwhile KK were serving up evening kebabs to guests. Around 8.30 David and Kat had their first dance to a special remix of John Legend 'All of me', that David had produced. It started off acoustic and switched into Dubstep after two minutes. Paddy and Manny kept the dance floor packed and David even played a little set himself. At 11pm the music switched to a silent disco and The Goonies was screened above the shed, with our dead tree as an eerie backdrop. FF - You clearly had a vision, did it develop along the way as you came across different suppliers or did you always had a clear picture of what you wanted? D&K We had a very 'loose' vision. We have both been to many weddings and have come to realise that as long as guests are fed, watered and have somewhere to party, you need to make sure the rest of the day reflects what YOU want as a couple. I think couples can lose sight of this and can easily be bought in to the 'pre-packaged' idea which often doesn’t offer much flexibility. 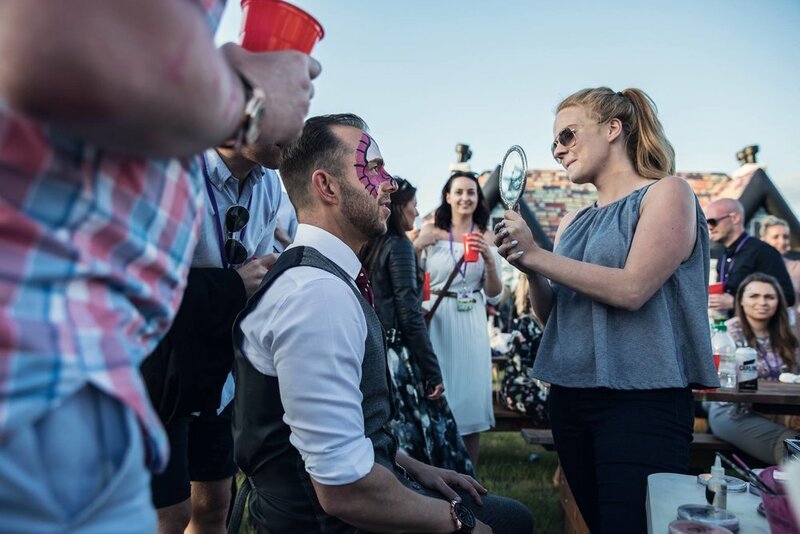 Our 'Vision' was a relaxed, casual affair where people would buy into the festival vibe first, and the formalities of the wedding second. FF - Any top tips for other couples planning this kind of wedding? D&K Become fluent in excel.....But seriously, spreadsheets are no fun, but they are necessary. With a DMOIY (Do most of it yourself) wedding, you need to plan for everything from toilets to tampons, candles to condoms! Don't be afraid to delegate to someone like Nikki - that local knowledge and extra set of eyes on everything was invaluable. Make sure that your suppliers are flexible - what we first started out with was totally different than our needs 4 weeks out. Ask your suppliers to provide examples of previous work, and ask their opinions before committing. Mistakes/mishaps will happen - due to the flexible nature of the day, nobody noticed when timings were out so don’t stress and pick up another drink. Budget permitting, make it an all day and night affair and try not to have day/night guests - we wanted everybody to experience the whole festival from midday through to midday the following day. FF - Always the trickiest question but what are the highlights of the day for you both? D&K For us, seeing people's faces and reactions when they walked down the path to the 'Hidden Valley' was priceless. Most people had assumed they would need to drive from the ceremony to the reception, so their faces when they walked around that corner is something we'll never forget. The outdoor dancefloor when the sun was going down was also pretty special - 180 guests all throwing it down!! FF - Was your day all you hoped it would be? D&K And more......When we look back at all of the planning and hard work that went into it, we ask ourselves what would we change? Genuinely nothing - apart from making it a whole weekend event so we could make use of the leftover alcohol (which we are still drinking 9 months on). to subscribe to our Blog and receive updates, tips and inspiration.